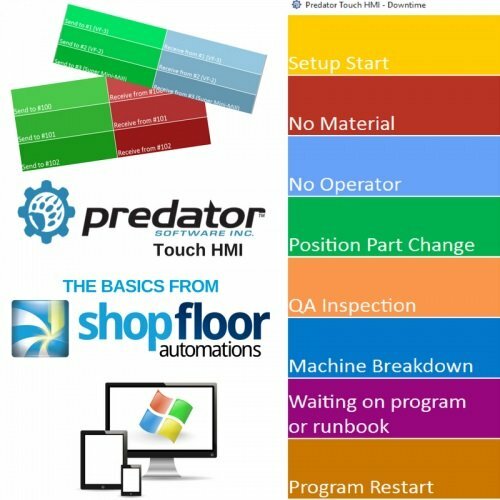 Predator Touch HMI, a relatively new application, is a favorite here at Shop Floor Automations. We wanted to take the time to do an in-depth piece on its benefits. What can best be described as a big button interface, Touch HMI is an application that operators to use to simplify sending and receiving programs to and from machines. For shops employing machine data collection, they can put in downtime codes that the operators can choose, such as setup or preventative maintenance, for example. Touch HMI can be accessed from any Windows-based platform, such as a compatible tablet or cell phone, as well as a network PC. Touch HMI can communicate over a network, wired and wirelessly, as well as via a serial connection. This time-saving interface consolidates multiple automation platforms with features like data collection, DNC, plus other types of document control platforms. You can automate processes on the machine, and really any third party software can be integrated with it. It acts as one common place for the operator to interact with that looks visually pleasing and is easy to understand. Predator DNC is one tool used to communicate with and network CNC machines. Touch HMI makes communicating easier than all the different alternatives currently available. You can use it with a bar code reader, but it can also replace what a bar code does, too! Custom color coding is also an option SFA has for customers to make the system easier to read. Another great feature of TouchHMI that you may not have thought about? Because the Internet of Things is such an influence in the manufacturing industry, a button can be customized on an individual client’s interface that is a supplement to their daily schedule. Want a button that goes to a web browser, so your operator can order lunch and have it be ready for pick up when they go on break? Or a button where a tech can request time off? A button on the interface that can report work hazards is also a possibility. Anything you can think of to put on that extra button is likely a can-do by our creative technical team, so call us to learn more at 877-611-5825!